Overhead view of Coach Shop 2 at Beech Grove in 1980. Sheet metal worker Steve Osburn was hired by Penn Central in May 1970 after serving four years in the United States Air Force. He came to Beech Grove two years later and is now the longest-serving active Amtrak employee at the shops. Osburn is proud to tell people that he is a third generation railroader. Half of his 14 siblings have also worked in the industry, holding positions such as boilermaker, electrician and cement worker. Two of his children are carrying on the tradition at Beech Grove. Sheet metal worker Steve Osburn applies teflon paste to air brake components. 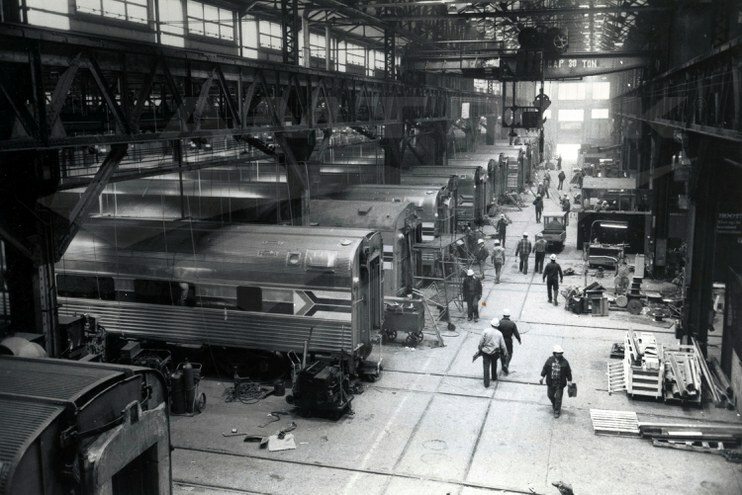 Osburn initially repaired the pressure lines on the steam-heated passenger cars that Amtrak purchased and leased from the predecessor railroads. A boiler in the locomotive heated water to create steam that was piped throughout the cars to provide heating; lighting and air conditioning were supplied by a generator and batteries in each car. In Fiscal Year 1978, Amtrak began a program to convert cars to modern electric head-end power (HEP), which uses electricity generated by the locomotive to perform those same functions. While coating pipes and other air brake components with sticky white Teflon tape and paste—“for a good seal”—Osburn recalls other jobs he’s held over the years: working in the powerhouse, ordering parts for the diesel shop, rebuilding valves in the component shop and rebuilding trucks (wheel assemblies). 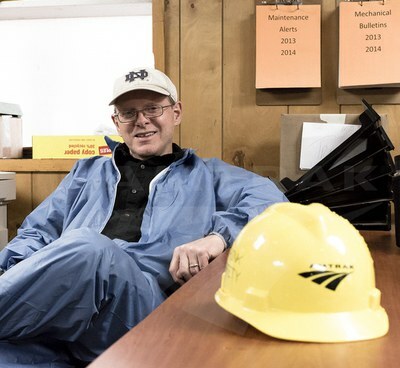 Asked about what’s changed in railroading and the shops over four decades of Amtrak ownership, he notes a strong emphasis on safety, which includes basic gear such as hardhats and protective eyewear, as well as programs to encourage behavioral change. Safe-2-Safer, the most recent comprehensive Amtrak safety program, launched in 2009 with the goal of reducing injuries through a collaborative approach to safety and accident prevention. This is accomplished through training, coaching, greater personal accountability and engagement through peer-to-peer observations and feedback. “Helping someone else, you help yourself too,” says Osburn as he recounts the mentors who helped him perfect his craft and advance his career. He is now in the position to pass on knowledge to a new generation of workers coming into the forge shop, where he works, as well as the coach, trim and diesel shops. He notes that Beech Grove employees, who represent various crafts and include carmen, pipefitters, boilermakers and machinists, “stick together” and help one another in the workplace and in their personal lives. In retirement, Osburn plans to travel the country by train with his wife. There’s a good chance that he’ll ride in some of the cars he has helped maintain and overhaul for decades. Routes such as the Empire Builder (Chicago-Portland/Seattle) and Coast Starlight (Los Angeles-Seattle), known for the scenic landscapes through which they pass, are high on his list. Read about Osburn's colleague Gary Woods. The Amtrak History interview with Steve Osburn took place on April 2, 2015.